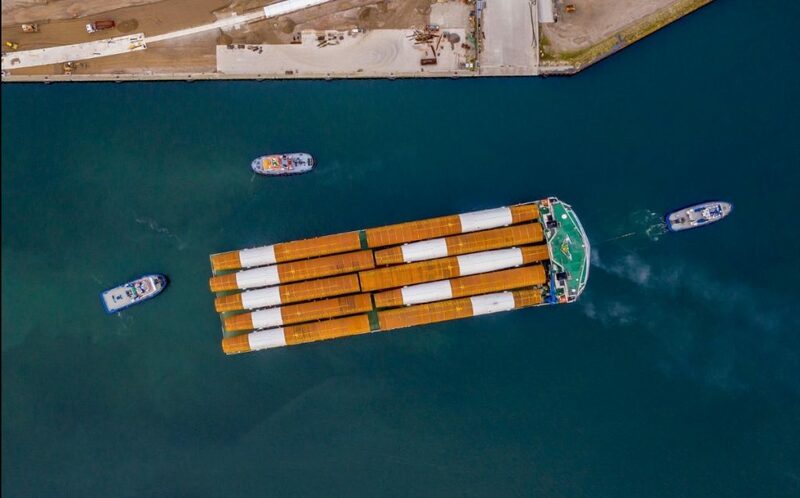 All 20 foundation monopiles built for the Formosa 1 Phase 2 have left the EEW SPC yard in Germany onboard two heavy load transport vessels and are en route to Taichung port in Taiwan, Jan De Nul said. Now that these components for the offshore construction are mobilized, the actual installation operations on site can be kicked off very soon, Jan De Nul said. Jan De Nul’s scope entails the procurement and installation of the foundations, including scour protection and cables. Construction will be completed in 2019, the company said. Apart from the overseas procurement and services, Jan De Nul has finalized various service and subcontract agreements with local entities in Taiwan. After having appointed Taichung Port as marshalling harbour for the project, Jan De Nul set up its local supply chain, which includes quarry rock production for the foundation scour design, rock load-out operations, storage and transport of the foundation structures, installation of transition joint bays and land cables installation. The Formosa 1 offshore wind farm is located 3 kilometers off the coast of Miaoli. Formosa 1 Phase 1 comprises two Siemens 4MW demonstration turbines, the very first offshore turbines installed off Taiwan. Formosa 1 Phase 2, the extension of the existing Formosa Phase 1 wind farm, will feature 20 Siemens Gamesa 6MW turbines with a total output of 120MW. The Formosa 1 Phase 2 is owned by Formosa I Wind Power Co. Ltd., a partnership of Ørsted A/S (35%), JERA (25%), Macquarie Capital (25%), and Swancor Renewable Energy Co. Ltd (15%).